There are problems when using portable version on Windows 10 / 8.1 and Windows Defender folder protection is activated! This rule is also ... for the Freeware Tool AlwaysMouseWheel from Versoin 4.01! Many users who do not know exactly that the portable applications in the working directory store, the settings and this is no longer possible with Windows 10 and enabled Defender folder protection, especially if the program is launched from the desktop. For this reason, there are two versions in the download area from version 4.31, once standard and the portable version of Don't Sleep. 2.) ... The standard version Don't Sleep! 3.) ... The portable Version Don't Sleep! 2.) The standard version of Don't Sleep! No personal data is stored here, only the program-specific and personal program settings of Don't Sleep ;-)! 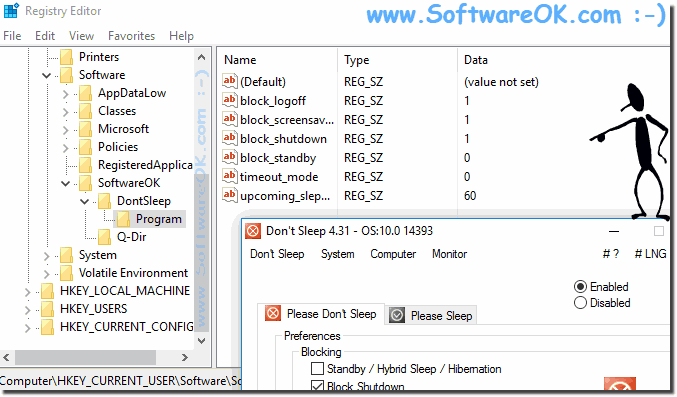 (Image-1) Standard Don't Sleep Settings on Windows-10! 3.) The portable Version Don't Sleep! The portable applications saves the settings in Don't Sleep working directory, please do not use folders with folder protection in Windows 10, otherwise the settings can not be saved. For better recognition from 4.31 in the program title is also the indication that it is the portable version of DontSpeep.exe. (Image-2) Portable use of Don't Sleep on Windows 10! 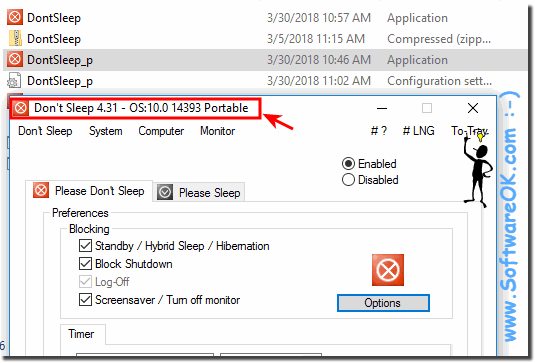 DontSleep - FAQ-14: Portable use of Don't Sleep on Windows 10 and protected folder problem!